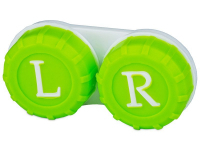 This handy, flat lens case features left and right indicators on the top of the case for easy, reliable storage of your lenses. Most users are comfortable with this common, easy to handle design. Keep in mind, a lens case is only necessary for monthly and bi-weekly lenses that require overnight storage and cleaning. And, make sure you have an adequate supply of solution for your on-the-go lifestyle by choosing one of our popular solutions here.